The Harvest is a movie I come very close to loving. Unfortunately, there are some climactic speedbumps that frustratingly keep me from doing so, some oddly disjointed and annoying script contrivances that end up being impossible to overlook. At the same time, somehow, someway, director John McNaughton (Henry: Portrait of a Serial Killer) and screenwriter Stephen Lancellotti keep things more or less on track, their creepy, unsettling endeavor building to a gut-wrenching conclusion I found wonderful. Andy (Charlie Tahan) is sick. His overly protective mother Katherine (Samantha Morton), a highly respected surgeon, barely lets him out of his bed, let alone his room, constantly worrying the strain will be too much for his fragile condition. 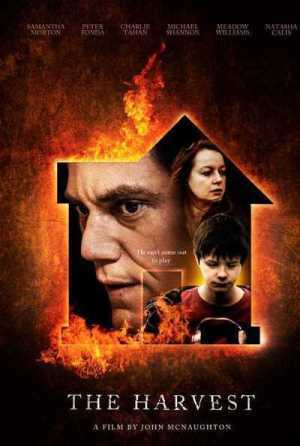 Meanwhile, his loving father Richard (Michael Shannon), a former nurse now relegated to housemaid status, thinks the boy should be given at least a modicum of freedom, allowing his son to tackle some of the smaller problems confronting him in hopes of building up the lad’s overall confidence. Maryanne (Natasha Calis) has just moved into town. Forced to live with her grandparents (Peter Fonda, Leslie Lyles) after a tragedy, while stumbling her way through the woods around her new home she happens to end up in the middle of Andy’s backyard. One thing leads to another and the pair strike up an unlikely friendship, and while Richard is perfectly okay with this Katherine is livid, putting up a variety of obstacles in order to keep the kids apart. Lancellotti’s script lulls one into a false sense of security, setting up a tidy, rather obvious scenario inherently ripe with melodrama. 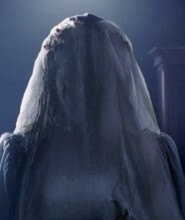 But nothing is what is appears, Maryanne almost inadvertently discovering her inner Nancy Drew uncovering a startling secret in Katherine and Richard’s basement that changes the tenner of the film instantaneously. What begins as a foray into a world reminiscent of the films of Robert Mulligan (To Kill a Mockingbird, Man in the Moon) suddenly becomes something bleak, unsparing and brutally unsentimental, the central twist a horrifying shocker that paints Andy’s ailments in a whole new light. What’s most intriguing is just how comfortable McNaughton appears to be handling this bait and switch. The first half of the film is light, almost playful, George S. Clinton’s (the Austin Powers trilogy) ingenious score lulling me into a false sense of security thanks to his homey, borderline corny old fashion refrains. But the man behind features as diverse, and divisive, as Mad Dog and Glory and Wild Things knows exactly what it is he is doing as well as the best road to wander down to get him where he wants to end up, the film’s transition from coming of age opus to full-on, unsympathetic thriller remarkably well done. If only Lancellotti’s writing was as dexterous and as self-assured. Maryanne’s grandparents, while well-played by both Fonda and Lyles, are curiously stupid, and the moment their charge walks in spinning gruesomely descriptive tales of woe and peril the two of them instantly enter into the cinematic parental unit hall of shame. The fact they don’t even grant the girl’s story even an ounce of credence is mind-boggling, letting her proceed in her potentially lethal investigation into the secrets contained within Andy’s basement even more so. They’re idiots, flat-out, no disclaimers, no codifiers, and as such my affinity for the film was lessened quite a bit because of this. Thankfully, not only are the two child actors challenged with anchoring all of this craziness excellent, McNaughton’s decision to let Morton and Shannon cut loose, run wild and by all accounts make the most of every moment they appear onscreen proves to be a smart one. The pair, both former Academy Award nominees, consume their two characters with assertive relish, fleshing them out in ways that are challenging, complex and, most of all, vigorous first moment to last. Morton, in particular, is on fire, carving herself a piece of the action that’s maternal and demonic, mixing the divine and the irredeemable with raucous abandon. The Harvest isn’t without its missteps. Some of the third act developments are more than a little silly, while the stuff with Maryanne’s grandparents continues to grate on me something terrible. But the cast is universally excellent, while McNaughton’s handling of the story’s constant shifts in focus are astonishing. Most of all, though, the movie did its job, shocking me senseless while keeping me sitting on the edge of my seat, Andy’s survival contingent on his new friendship with the girl next door being far more corporeal and honest than any other element in his strange, ethereally surreal adolescent life.